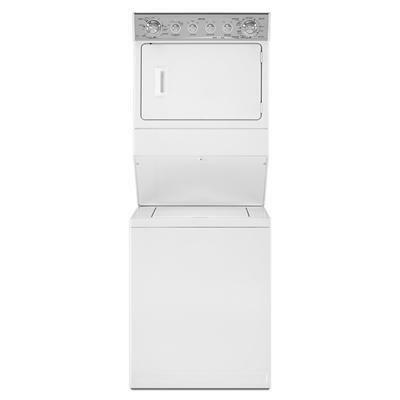 Even if your laundry room isn't exactly what you'd call "spacious," you won't have to sacrifice performance for practicality with this stacked electric washer/dryer. The washer features nine automatic wash cycles, including delicates and presoak/pretreat, to attack tough stains. The washer's DependableClean™ system rolls clothes through the wash and rinse cycles to provide a reliable clean. Three water levels ensure you don't use more water than you need, and the PureClean™ and SpinSpray™ rinse systems give your loads a thorough cleansing. In the dryer, the IntelliDry® sensor helps your clothes avoid damage by overdrying. Because quality doesn'thave to take up a lot of room. Dispenser Automatic Dispensers: Bleach, Fabric Softener. Capacity DOE 2.5 cu. ft. / 0.07 cu. m.
Optional Inlet hoses are required for installation, purchased separately. Inlet hoses are required for installation and are purchased separately. Recommended hose part numbers include 8212487RP (heavy duty nylon braided inlet hoses) and 8212641RP (high-grade rubber inlet hoses).